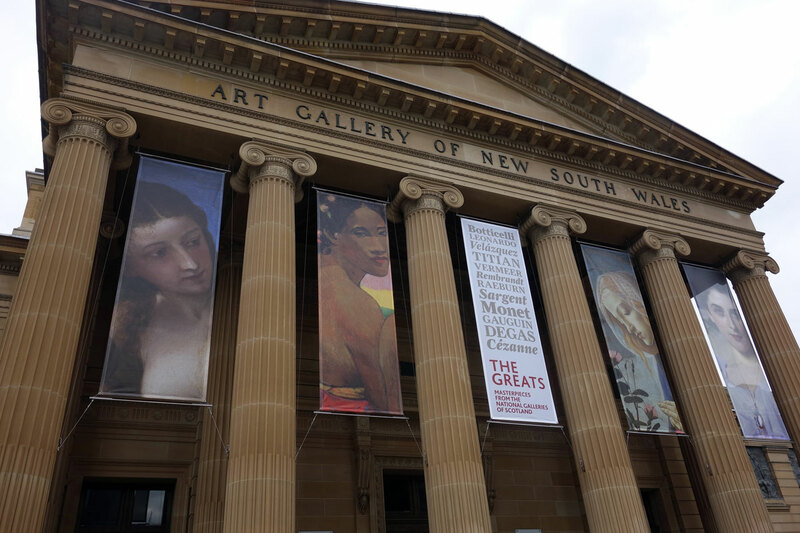 I was lucky enough to be up in Sydney to review the Julia Margaret Cameron exhibition at the Art Gallery of New South Wales… and the media preview for The Greats was on. What an unexpected bonus! This is part 1 of a monster 2 part posting on the exhibition which, in all honesty, is a bit of a hotchpotch of a blockbuster. But my god, what a hotchpotch it is. And the glorious frames of all these works. I do like a good frame! 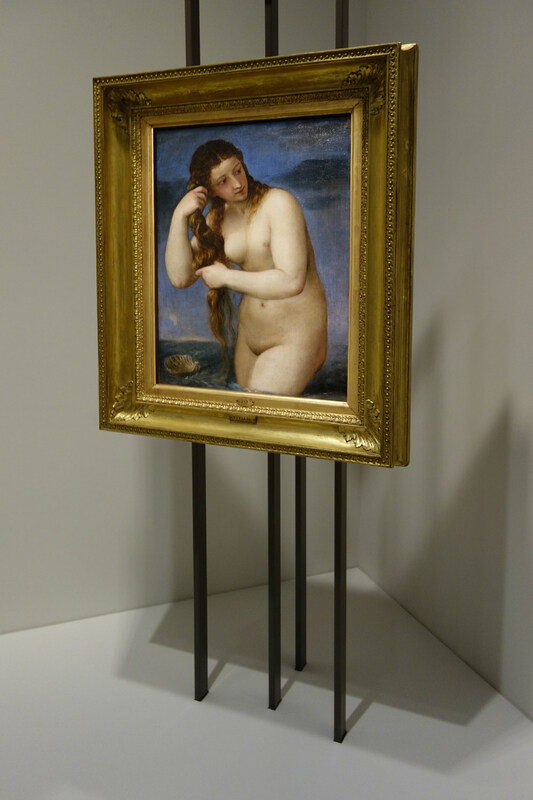 Titian was the most celebrated Venetian painter of his time. His wealthy and learned patrons spanned across Europe. 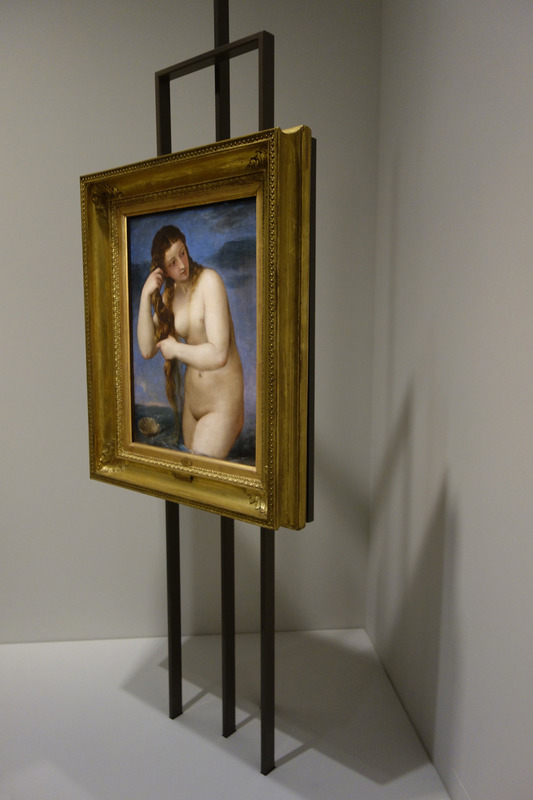 Well-versed in classical art and literature, including the myths of ancient Greece and Rome, they fuelled a strong demand for paintings like Venus rising from the sea c. 1520-25. According to legend, Venus, the goddess of love and beauty, was born fully grown from the sea. She was then carried to land upon a scallop shell, blown by the zephyr winds. 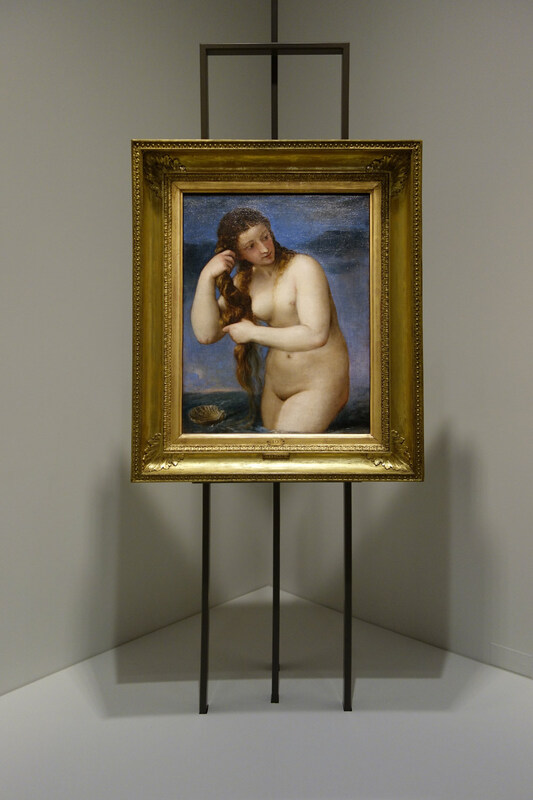 In Venus rising from the sea, Titian has painted the goddess as a beautiful and voluptuous woman, emerging from the sea and wringing out her wet hair, with a miniature version of her scallop shell floating nearby. Her long auburn locks, milky skin and blushing cheeks are sensuous and tactile, suggesting her seductive powers as the goddess of love. Venus’s gracious, twisting pose recalls classical statues of the goddess. Titian rarely made preparatory drawings for his paintings, preferring to work straight onto the canvas, applying subtle gradations of colour in soft, feathery brushstrokes. He also used live models to pose for his figures, which was uncommon in the early 1500s. 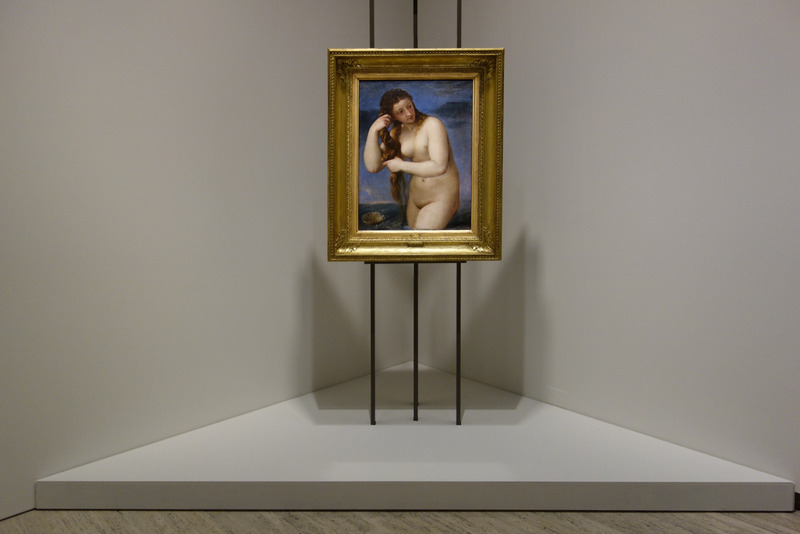 This lends the painting its great liveliness and sensuality – qualities that have made Titian justly famous. 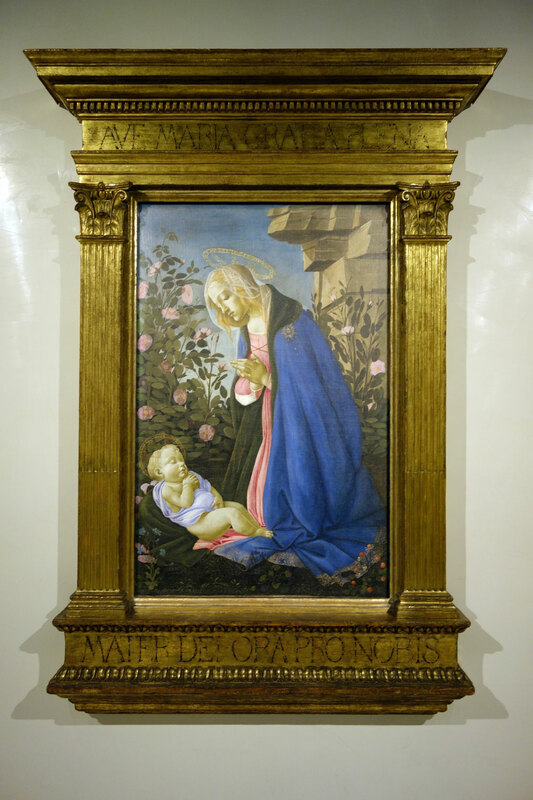 Painted by one of the most outstanding artists of the Italian Renaissance, The Virgin adoring the sleeping Christ child c. 1485 is the earliest work in the exhibition. It has not left the United Kingdom since 1846 and The Greats presents the first time in almost three decades that any painting by Botticelli has been exhibited in Sydney. In this devotional painting, the Virgin Mary kneels silently and prays before her son, the infant Jesus Christ, in a rose-filled garden. Her gown and cloak spill onto the ground to provide a pillow for the child, who is nestled among the flowers, asleep. Its simple composition, focusing on just the two figures, invites quiet contemplation. Like many Renaissance paintings, the picture is rich in symbolism. 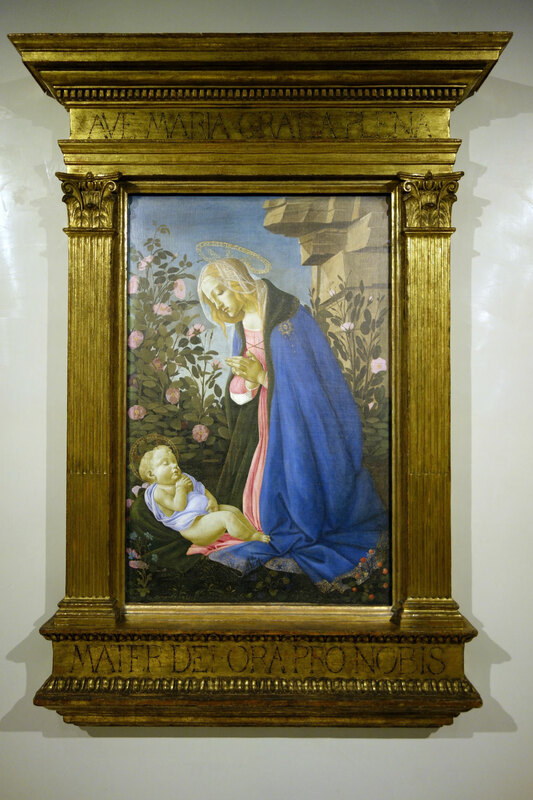 The enclosed garden is a reference to the purity of the Virgin, who was often called ‘a rose without thorns’. Some symbols are more ominous. 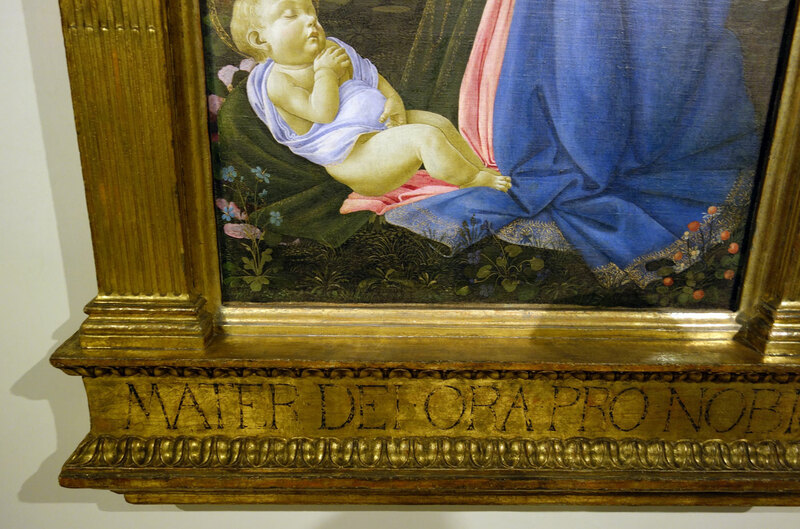 The sleeping child with his pallid complexion is presumably a reference to Christ’s eventual death. The red strawberry plant in the lower right corner symbolises the blood he will shed on the cross. 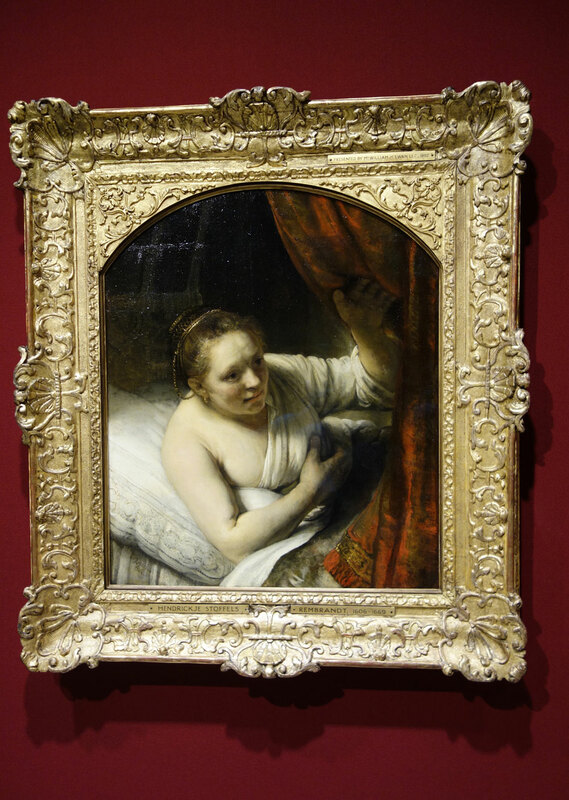 Technically the painting is unusual for the Florentine artist: it is quite small and has been painted on canvas rather than wooden panel. This suggests it was intended for a private home or convent, rather than a public space like a church. 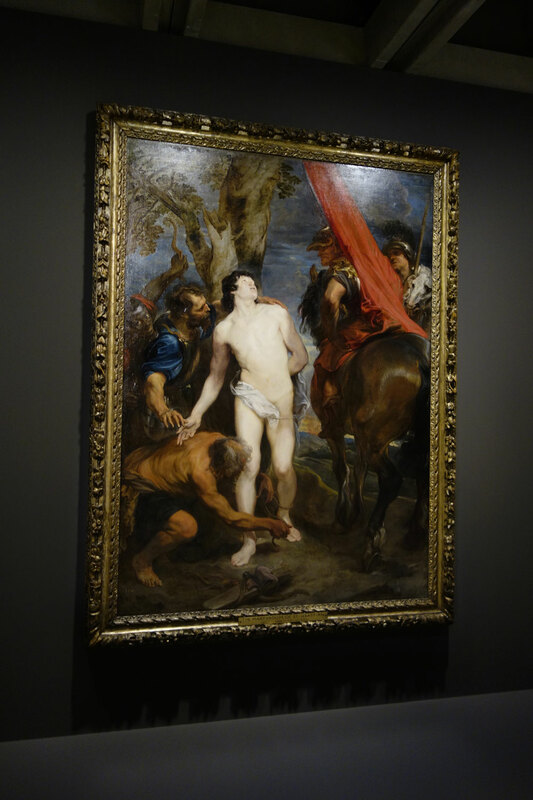 Anthony van Dyck, the most successful pupil of Peter Paul Rubens, is regarded as one of the masters of the Flemish baroque. 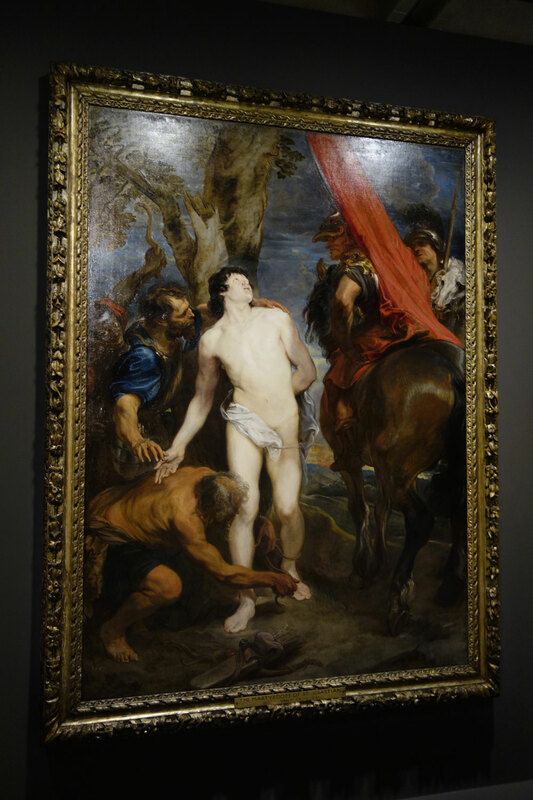 Painted just before Van Dyck left Flanders for Italy in 1621, this dramatic composition features Saint Sebastian, a Roman officer who converted secretly to Christianity. When Sebastian’s faith was discovered, he was tied to a tree and shot with arrows. Usually shown at the moment of his martyrdom, with the arrows piercing his body, here Sebastian has been portrayed prior to his execution. 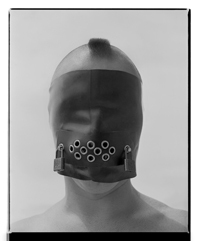 His twisting body and his upward-turned face seem to anticipate the punishment that is to come. 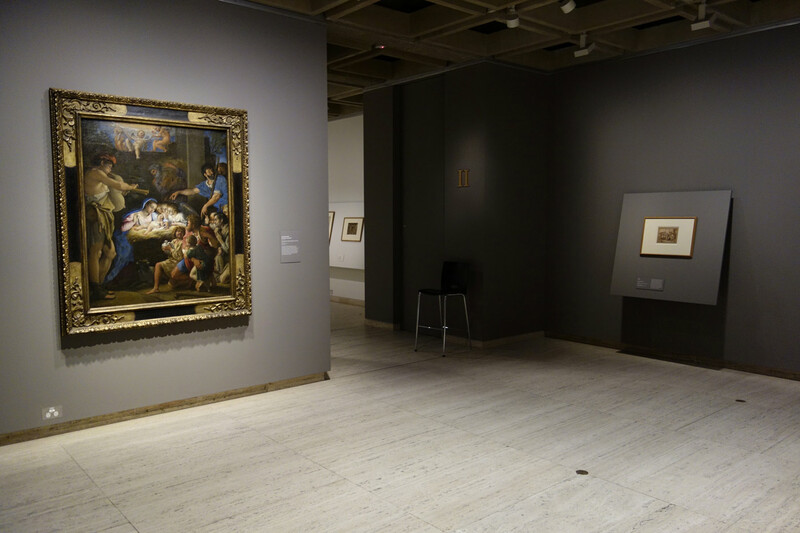 “The Greats: masterpieces from the National Galleries of Scotland is one of the most significant collections of European old master paintings ever seen in Australia and is presented as part of the Sydney International Art Series 2015-2016. Spanning a period of 400 years from the Renaissance to Impressionism, The Greats includes works by the most outstanding names in Western art, including Botticelli, Leonardo, Raphael, Titian, Rubens, Velázquez, Poussin, Rembrandt, Vermeer, Turner, Monet, Degas, Gauguin, and Cézanne. This richly presented exhibition brings together over 70 of the greatest paintings and drawings from the National Galleries of Scotland, based in the beautiful capital city of Edinburgh. 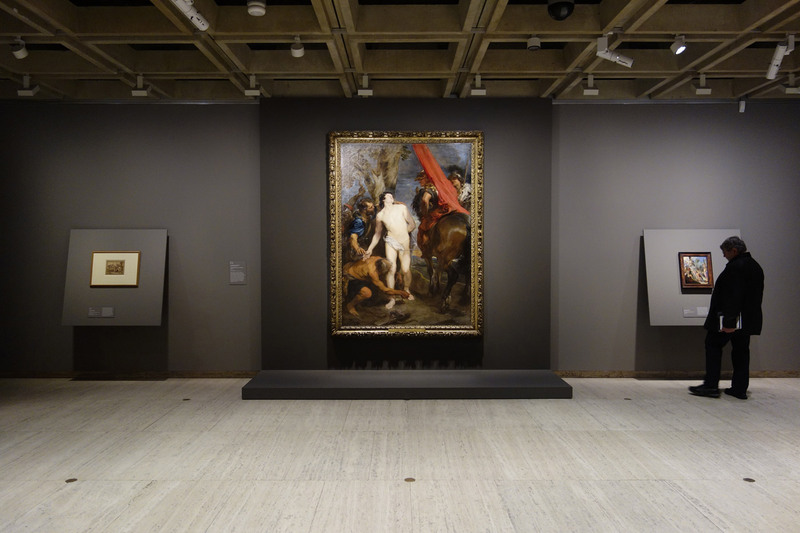 The Greats marks the first time these artworks have been exhibited in Australia, with the exception of Rembrandt’s A woman in bed (c. 1647) and Seurat’s La Luzerne, Saint-Denis (1884-85). 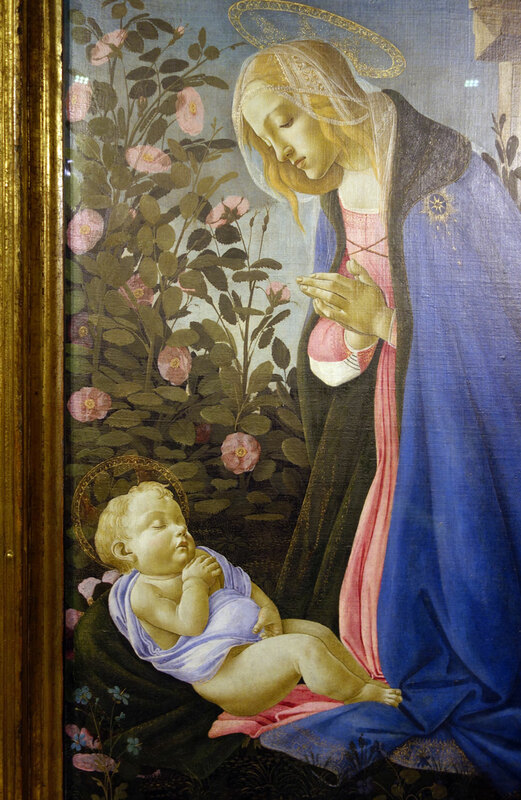 Botticelli’s Virgin adoring the sleeping Christ child (c. 1485) has not been exhibited outside of the United Kingdom in 169 years. 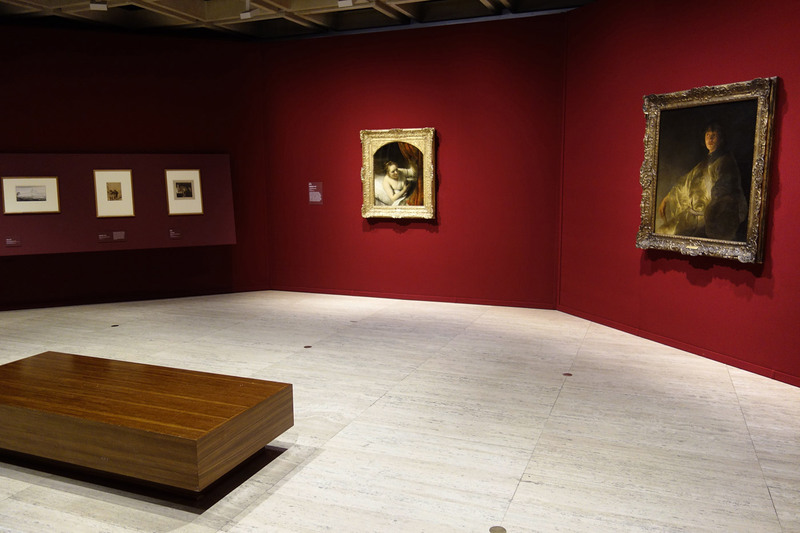 Director of the Art Gallery of New South Wales, Michael Brand, said it is a tremendous privilege to host such a fine collection of masterpieces in Sydney and that the Art Gallery of NSW is extremely grateful to the National Galleries of Scotland for their generosity and collegiality. “The Greats is a statement of unequivocal artistic excellence – each piece in this exhibition is of extraordinary quality. We are excited to provide Australian audiences the rare opportunity to come face to face with such unique and masterful artworks,” Brand said. 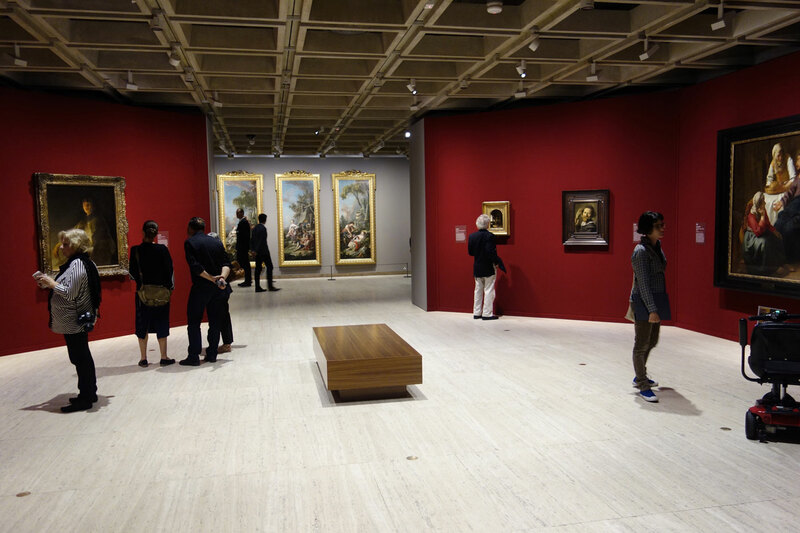 “Approaching the entrance to the Art Gallery of NSW, we are reminded of Sydney’s historic aspirations for viewing the creations of European old masters, with names such as Titian, Rembrandt and Botticelli adorning the Gallery’s sandstone facade. It is with great pleasure that we now welcome incredible works by these artists to our interior walls, into a sublime exhibition space that promises a moving and absorbing experience for all visitors,” Brand added. With his loose and seemingly spontaneous brushwork, combined with an exceptional ability to capture a sitter’s likeness and expression, Hals inspired generations of artists, from Jean-Honoré Fragonard to Édouard Manet. 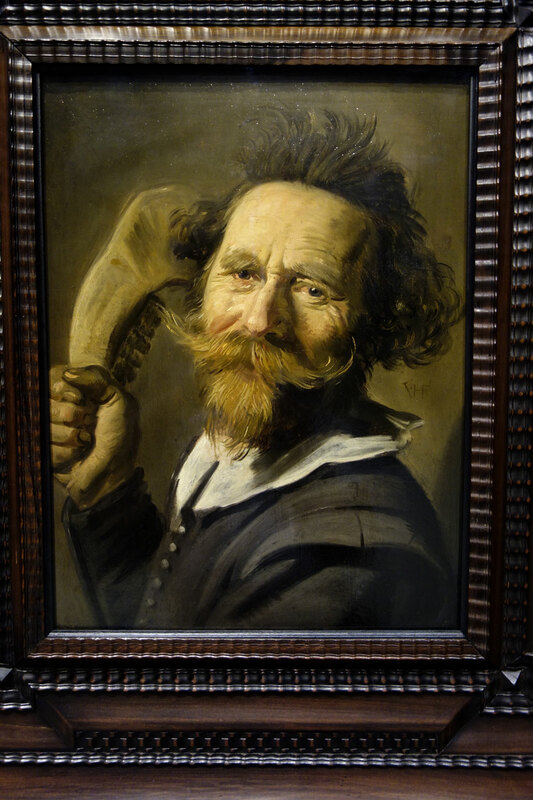 This portrait probably shows Pieter Verdonck, a Haarlem Mennonite, who was said to be aggressive and argumentative. In a contemporary engraving after the painting, an inscription reads: ‘This is Verdonck, that outspoken fellow, / whose jawbone attacks everyone.’ The jawbone that he holds is the same weapon used by the biblical hero Samson to kill the Philistines; here, it may refer to Verdonck’s ability to wound his enemies with his cutting words. The fame of Vermeer, now one of the best-known painter of the Dutch Golden Age, rests on just 36 paintings known to survive today. This canvas is music larger than his usual compositions and is the only one that illustrates a biblical subject. In spite of its uniqueness, the painting is replete with the quiet human interactions for which the artist is known. 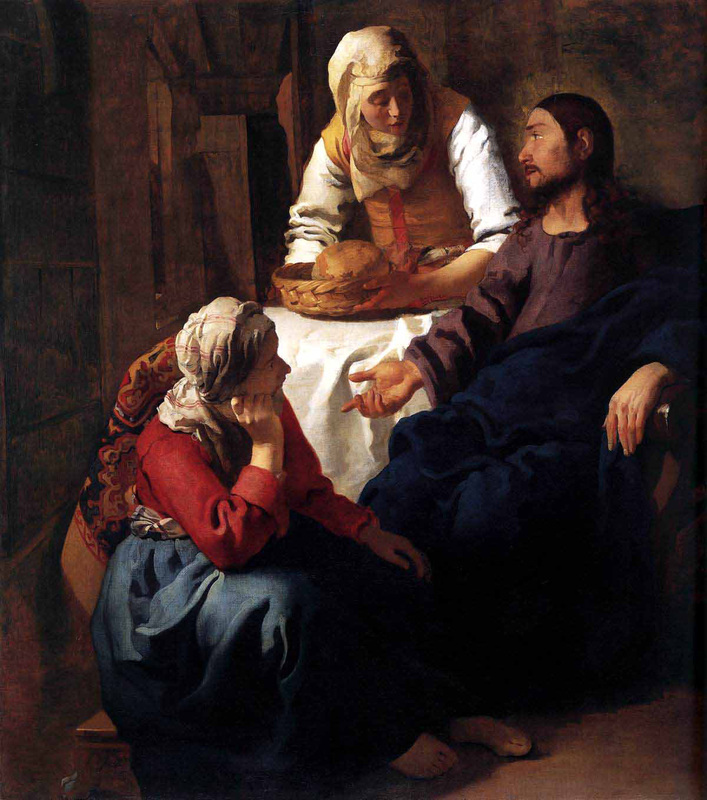 The scene depicts the story from Luke 10:38-42, in which Martha objected to her sister Mary listening to Jesus while she herself was busy serving. 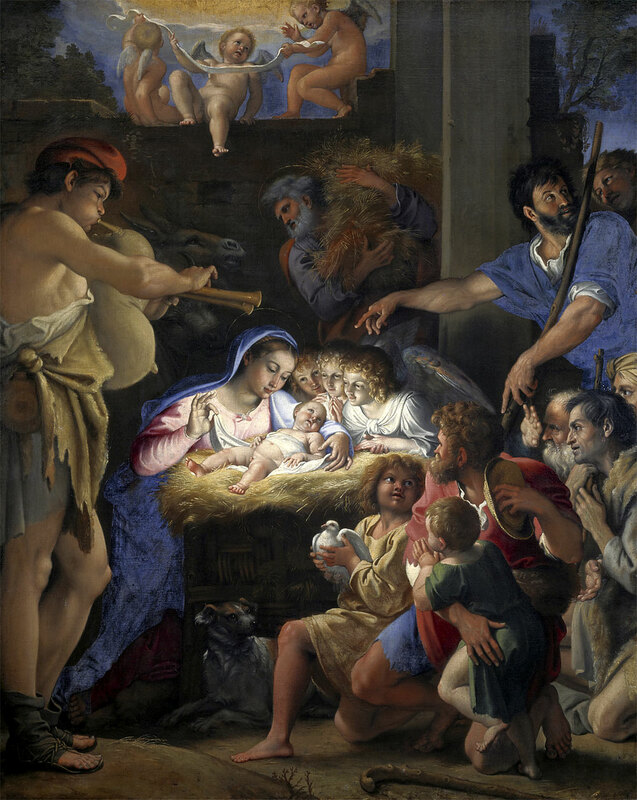 Given the substantial size of the canvas, it is likely that the painting was a specific commission, possibly intended for a Catholic church. The model for this painting is still unidentified. 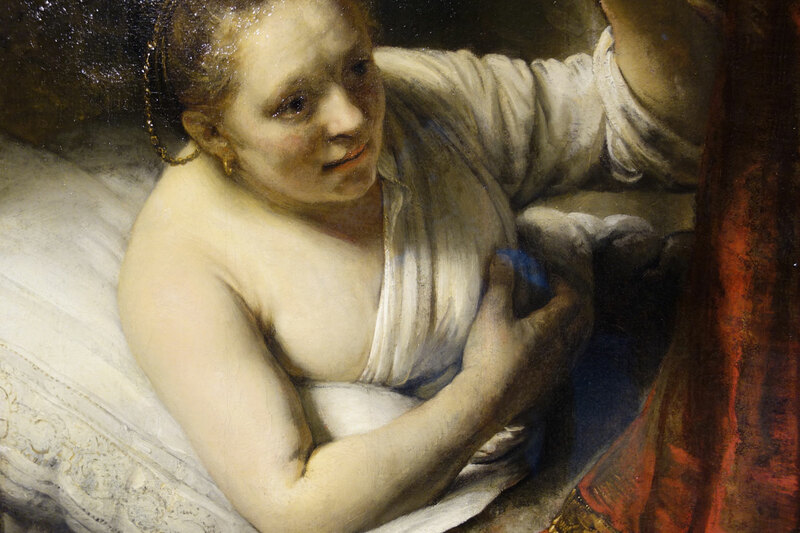 She might be any one of the three main women in Rembrandt’s life: his wife, Saskia; his son’s nursemaid, Geertje Dircx; or his family’s servant girl, Hendrickje Stoffels. Though intimate in its appearance, the painting is probably not a portrait, as a bed would have been an inappropriate setting for a respectable female model. The figure most likely represents the biblical character Sarah from the Old Testament Book of Tobit. 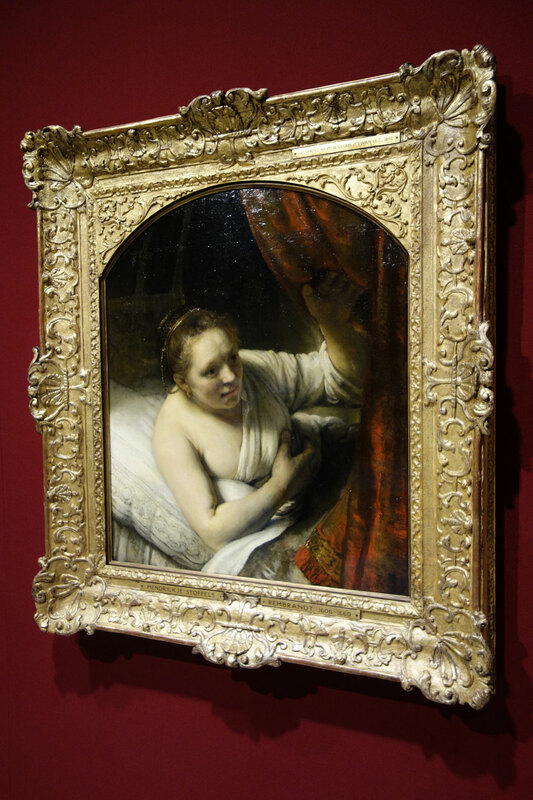 Rembrandt shows her watching anxiously as her bridegroom Tobias chases away the devil that had murdered each of her previous seven husbands on their wedding nights. 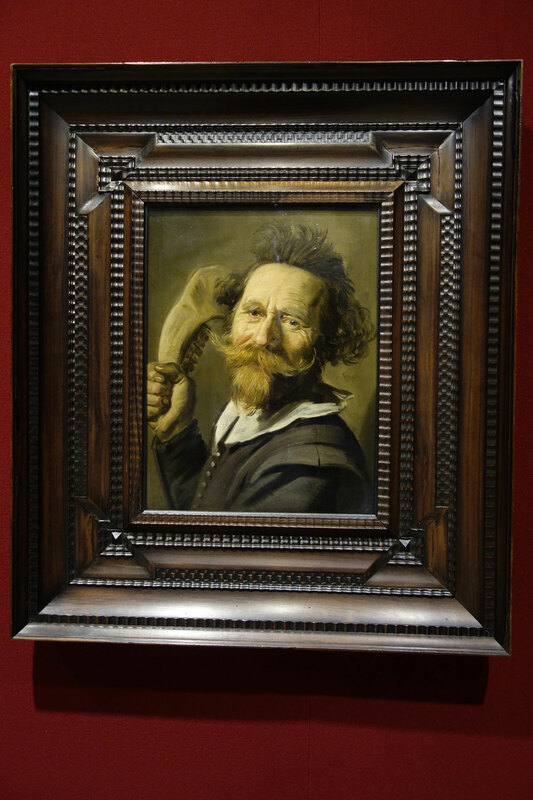 Jan Lievens and Rembrandt van Rijn were two young artists working in Leiden in the years around 1630. They worked separately, though they engaged in artistic competition and exchange, as this painting suggests. 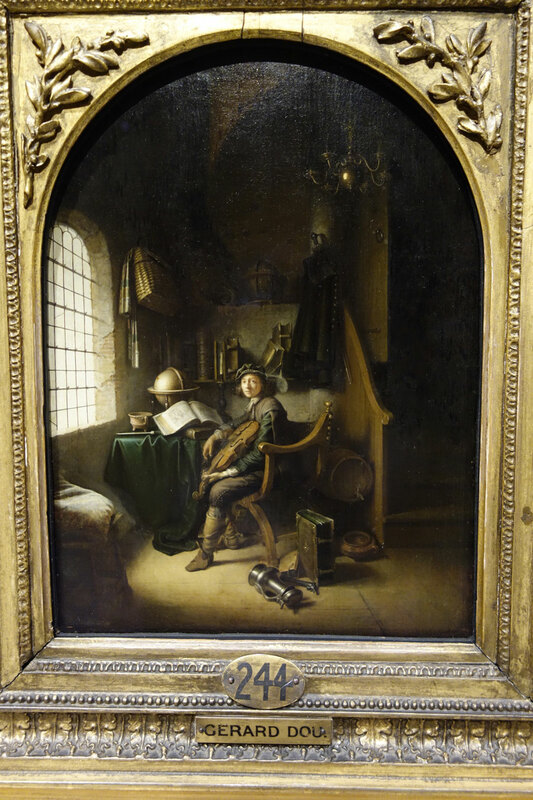 The dramatically lit depiction of a young man posing as a commander with his gorget and baton is not a true portrait, but a tronie – a Dutch term for a painting that features an exaggerated facial expression or a figure in an almost theatrical costume. 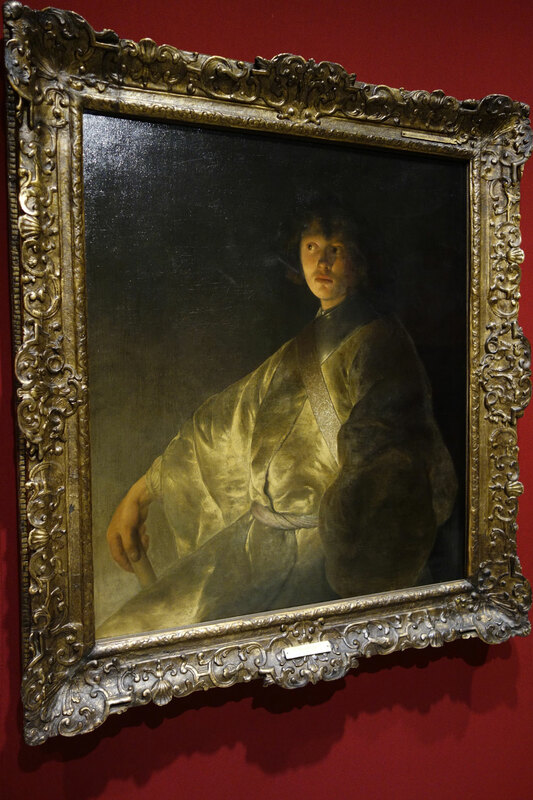 Both Lievens and Rembrandt experimented with tronies early in their careers, often introducing members of their families or their own likenesses. Veronese was famous in his lifetime as a master of rich colour. His paintings often show exotic figures, sumptuous fabrics and such seemingly incidental details as the spaniel pictured at lower right. The depiction of a dog, a symbol of marital fidelity, was intended as a clever and ironic commentary on the adulterous relationship between Venus, the goddess of love and wife of Vulcan, and Mars, the god of war. This canvas was presented as a diplomatic gift on behalf of the Spanish Crown to King Charles 1 of Britain during his trip to Spain in 1623. This enigmatic composition has been described as an allegory to fable (fábula), though its specific meaning has long been debated. 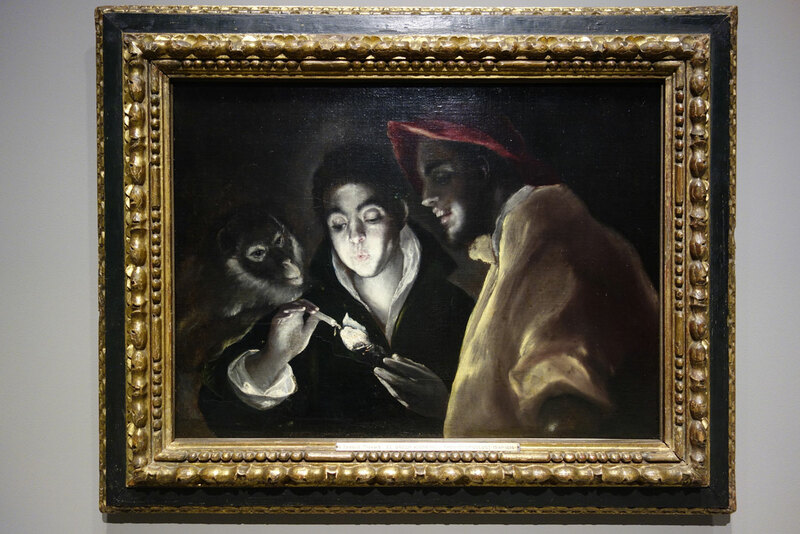 One possibility is that it is a recreation of a lost painting of a boy blowing a fire, made by the ancient artist Antiphilus of Alexandria and known from a text written in the 1st century by Pliny the Elder. 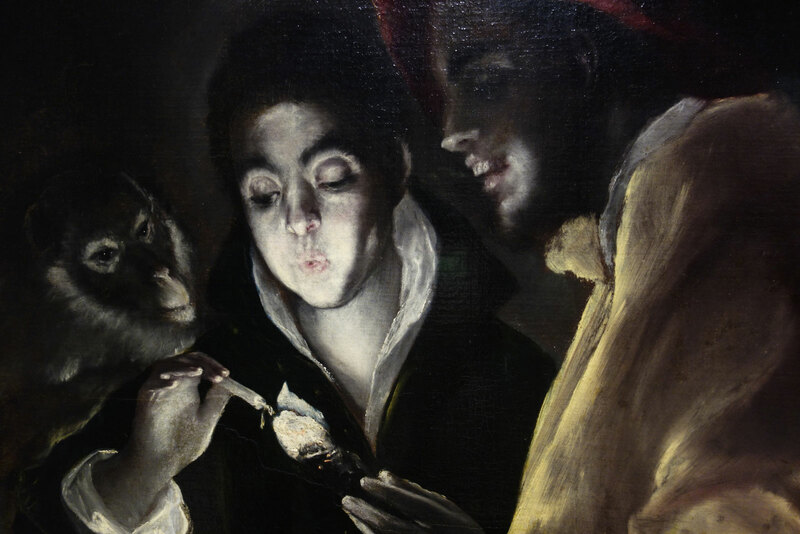 The presence of the monkey evokes the classical notion of art as the ape of nature, while the man, whose toothy grin and red and yellow attire identify him as a jester, may allude to the ultimate folly of the painter’s aim of reproducing the visible world – or, perhaps, of imitating the ancients. This simple scene of everyday life in seventeenth-century Spain displays the technical sophistication of painter Diego Velázquez. 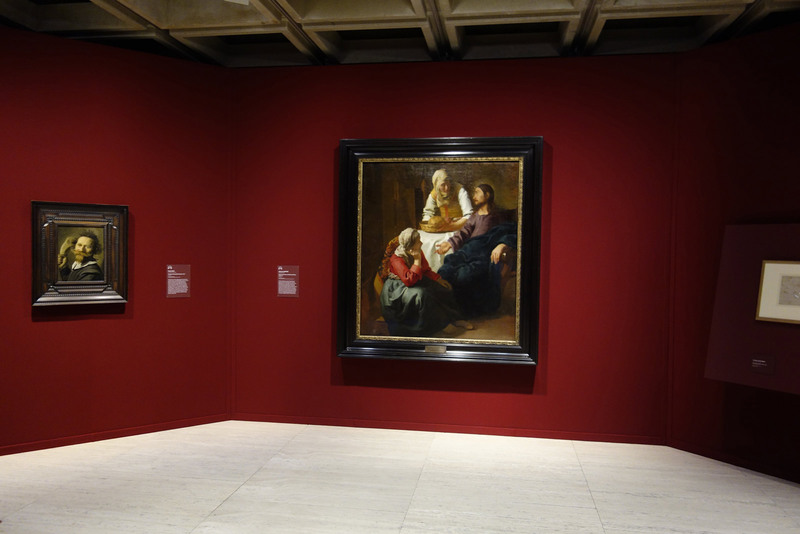 No Velázquez of comparable importance has been seen before in Australia. And indeed, the painting marks the Scottish National Gallery’s most expensive purchase to date. 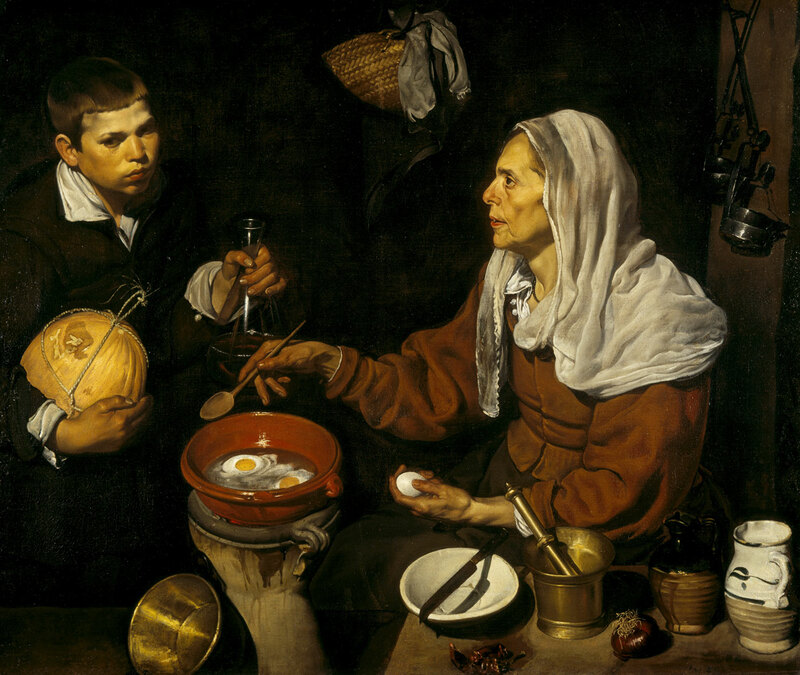 Painted in 1618 when the artist was just eighteen or nineteen years old, the work depicts an old woman cooking eggs in a red-glazed pot, while a young boy holds a flask of wine and a melon. The subjects were real people, perhaps family members or neighbours, and both reappear in other paintings by the artist. 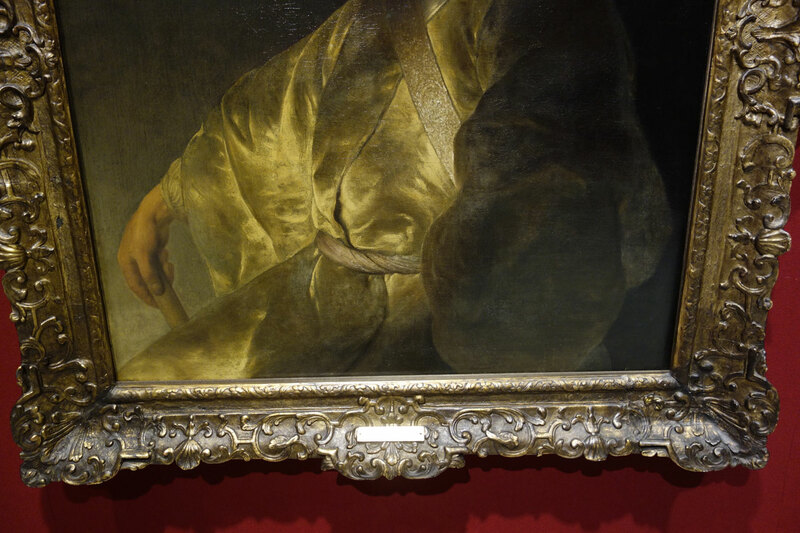 It is likely that Velázquez painted the objects and figures directly from life. The scene is painted with utmost care and detail. His depiction of light and the textures of objects is meticulous – from the soft folds of the woman’s headscarf, to the thick glaze on a ceramic pot, to the warm sheen of light hitting brass or copper. Unlike other portrayals of everyday people and humble genre scenes, this portrait presents its subjects with dignity, without mockery or censure. 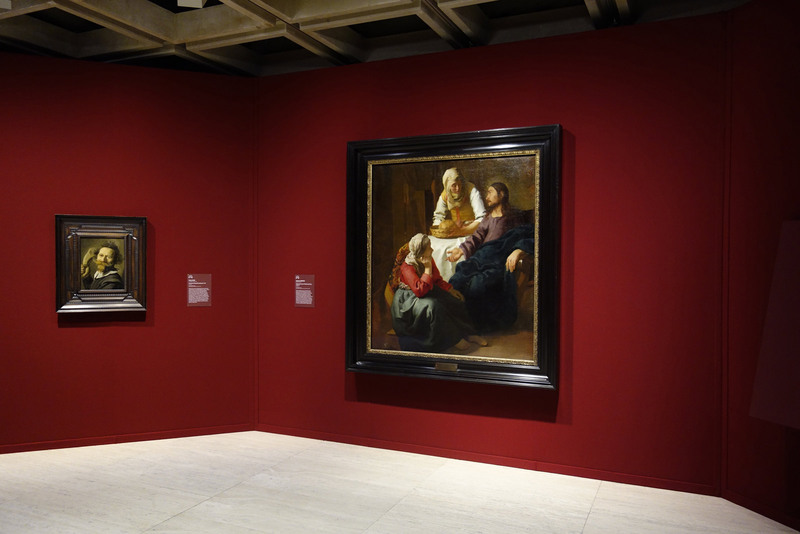 The extraordinary skill of Velázquez was considered to be unprecedented in Spain at the time. Establishing himself as much-respected painter in his native Seville, the artist moved to the royal courts of Madrid in 1623 and was soon appointed painter to King Philip IV. Dou was the father of the so-called fijnschilders (fine painters), the Lieden school celebrated for its commitment to detailed illusionism and refined technique. This painting is rendered so precisely that it is possible to identify the open book, shown at centre, as De Friesche Lust-Hof (The Frisian pleasure garden), a popular Dutch songbook first published in 1621. The pages are turned to a comic number about the joys and sorrows of love, accompanied by an image of two lovers under a tree in a landscape. For the informed viewer, this depiction adds unexpected irony to the tranquil, melancholic portrayal of the young musician.